Holy Ghost Tent Revival will headline Shelter Fest 2016 on Saturday, August 27. 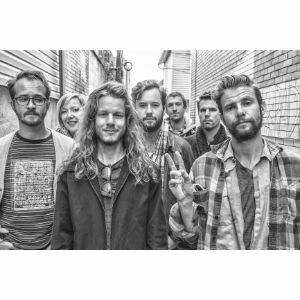 The American horn-driven rock and roll band with folk and blues leanings will perform a benefit concert to support the New River Valley’s homeless and others in need. Shelter Fest 2016 will take place in the Barn at Sinkland Farms on Riner Road in Christiansburg. Special guests will be The Apple Butter Blues Band and Black Wax Rebellion. Gates will open at 5:30 pm and opening acts will kick off at 6 pm. Holy Ghost Tent Revival and its boot-stomping energy will take the stage at 8 p.m. Food will be available courtesy of Due South Barbeque and adult beverages will also be for sale. Tickets are available for purchase online at unitedwaynrv.org or at Due South Barbeque for $16 or at the door for $20 (children under 12 get in for free.) The event will be held rain or shine. Holy Ghost Tent Revival started as a few students at Greensboro College hanging out and making music together. Built around founding members Stephen Murray and Matt Martin (both on vocals and guitar,) the group grew beyond its dorm room song writers into a dynamic band with a unique sound, gradually adding in trombone, trumpet, drums, and piano, according to an interview Stephen Murray gave No Depression, a “journal of roots music.” In 2007, once most of the band’s members had graduated, the group truly dedicated themselves to touring. Holy Ghost Tent Revival is a group of kids with a few instruments that grew up but never stopped having fun. The band is known for getting crowds up and dancing with what NPR describes as their unique blend of “New Orleans brass-band jazz,” with the classic rock of the 60s and 70s and a more contemporary indie-rock sound. They characterize themselves as “earthy jazz,” but perhaps Indyweek.com said it best when they characterized Holy Ghost Tent Revival’s unique sound not with a label but with as story: “With the mischievous air of a Mark Twain yarn, [the music]…conjures images of eras spent rambling from town to town, hopping between riverboats and trains, joshing with the locals, romancing with their daughters, and throwing back whiskey on the sly.” Holy Ghost Tent Revival will surely provide a night full of rollicking street jazz and hay-chewing banjo gaiety. Proceeds from Shelter Fest 2016 will benefit To Our House, a program providing winter shelter for homeless men, and the United Way of Montgomery, Radford & Floyd. To Our House, a New River Community Action (NRCA) program and a United Way agency, has provided temporary winter shelter to New River Valley homeless men for the past six years thanks to collaborations with faith- and community-based organizations and volunteers. To Our House was formed in 2008 after the death of a Blacksburg homeless man, Teddy O. Henderson; the organization (TOH) adopted his initials. This past winter, 48 New River Valley men were given a warm bed and hot meal through To Our House, and of those men, 12 guests received jobs and 25 received permanent housing as the result of TOH services. More information on To Our House can be found at www.ToOurHouse.org or on Facebook. United Way of Montgomery, Radford & Floyd unites local people and resources to improve lives in the New River Valley. Local United Way programs include: prescription discount cards; federal emergency and food shelter programs; financial, technical, and administrative assistance to non-profits; food and clothing drives; information and referral services; Christmas assistance program; school supply drive; and a volunteer center. UWMRF provides financial support to 26 partner agencies, including To Our House. More information on UWMRF can be found at unitedwaynrv.org. For more information about Shelter Fest 2016, please go to www.unitedwaynrv.org or contact info@unitedwaynrv.org or (540) 381-2066. For more information on Holy Ghost Tent Revival, please go to www.holyghosttentrevival.com.